100 point-of-lay Colombian Blacktip laying hens. 41 Norfolk Black turkeys for Christmas. 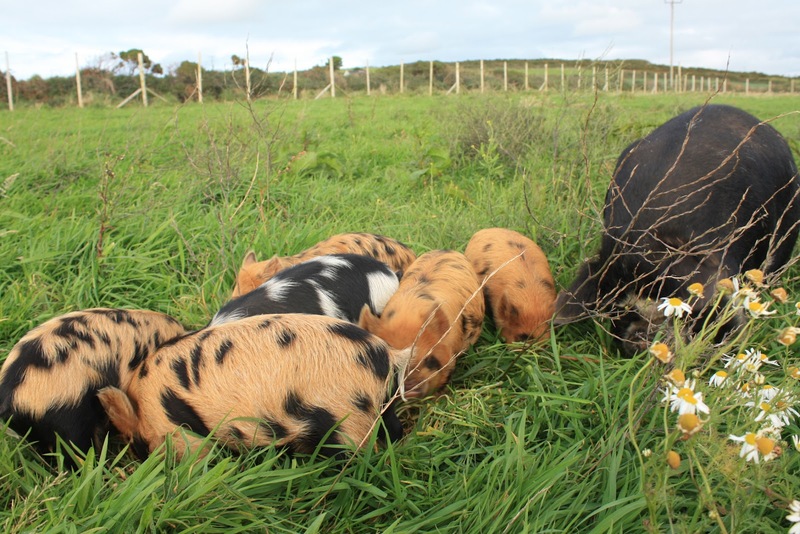 Ebony and her 6 kune kune piglets. Our community share offer raised a final total of exactly £17,000, which is a great effort, those shares being purchased by 135 members, mostly from the local area, with a few both national and international. 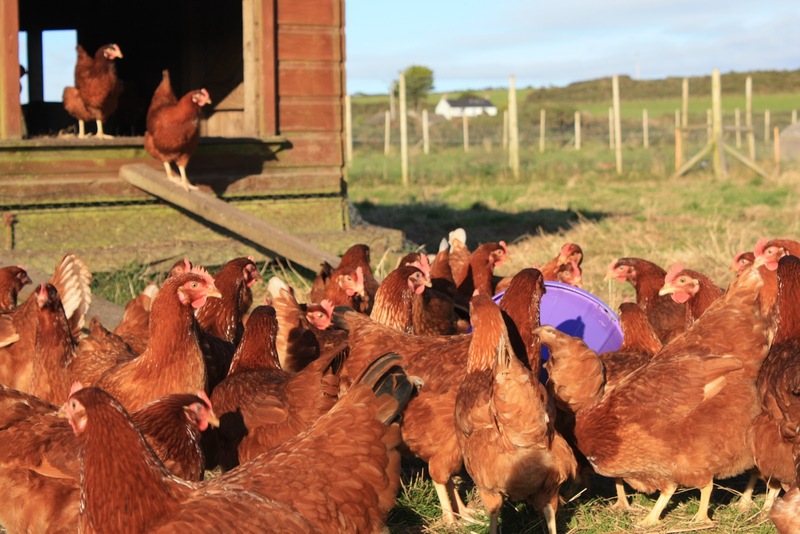 We would like to thank all our new members for purchasing shares, by doing so you have helped secure the farm's future as a community project, and shown your support for our work. It is still possible to purchase shares - please see our website www.bcfshares.org.uk for further details. 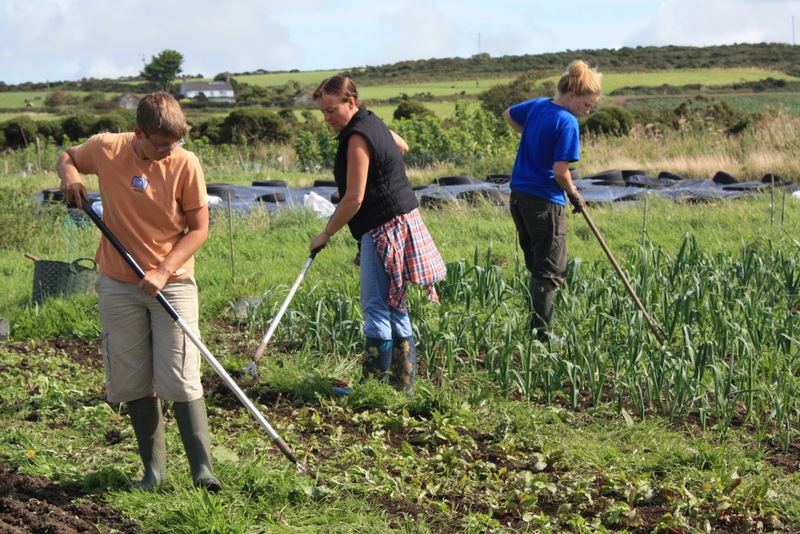 All Bosavern Community Farm volunteers are welcome to attend our volunteer meetings, which take place at 3pm on the second Tuesday and fourth Thursday of each month. The next meeting will be October 9th, and the following on the 25th. Meetings take place at tea break during Tuesday volunteer session, or on Thursdays after the volunteer session, and will last for half an hour. These provide more formal opportunities for volunteers to get together with the Community Farm Trainer to discuss what's happening on the farm, and to decide on future actions. Using Ellie's excellent turkey drawing, we've knocked up this little number to help sell our Christmas turkeys. They will cost £10.50 per kilo of finished bird, and we are now accepting deposits of £20. Please phone the farmhouse to order yours. We are now taking orders for Christmas turkeys. 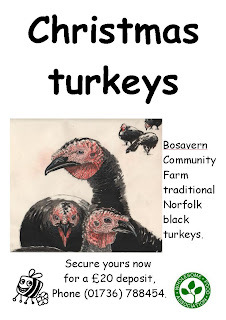 Like last year we are rearing traditional tasty Norfolk Black turkeys, with access to a large run on one of our fields. They can be visited - just come and ask. 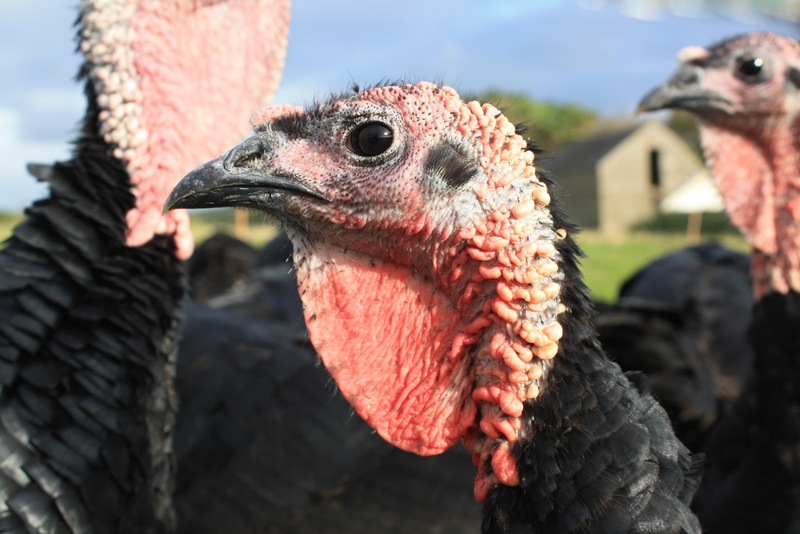 A deposit of £20 will secure your turkey, and it will be ready for collection (plucked!) just before Christmas. Please phone (01736) 788454 to reserve one. This coming Saturday, September 29th, there will be an informal art workshop in The Hive, 5-6pm. The workshop will be run by Ellie Pile, one of the farm's wwoofers, and artist of the turkey study below. The workshop will be open to all, with donations towards materials and the community farm welcome. Please bring some clean tetra-packs with you! 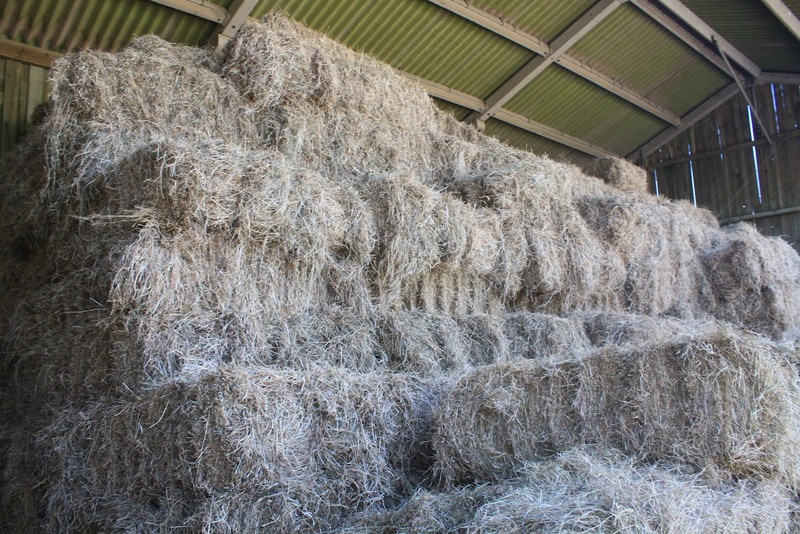 Like last year, we have small bales of our own hay for sale, at last years price of £3 per bale. Please call in to the farm to buy yours. Many thanks to Adam from California, who wwoofed with us for just over 2 weeks, and has now gone to work in the Peak District. Adam preparing seed drills for winter salads in the polytunnel. Sabrina also left this morning, after one week volunteering, also off to another farm upcountry. 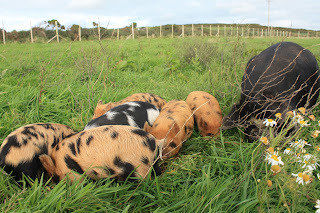 Thanks for your help, I'm sure the piglets will miss you! 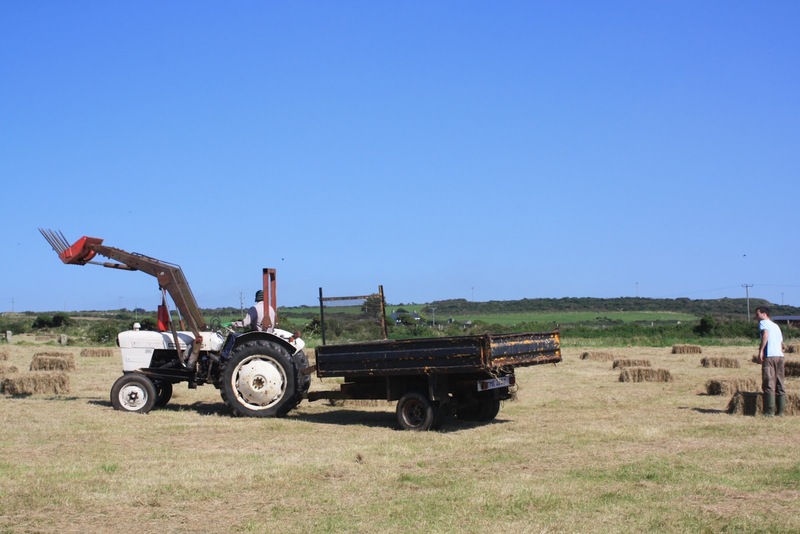 Lucy loading hay during the hay harvest. 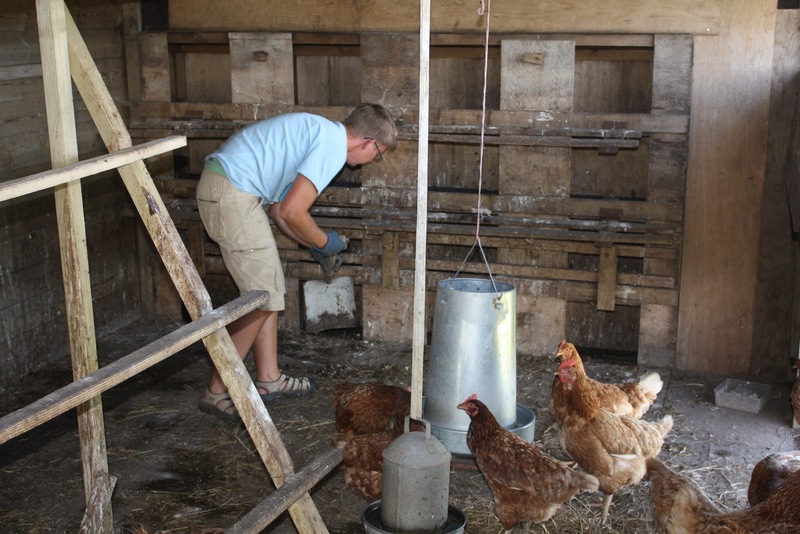 After three weeks volunteering as a WWOOFer on the farm, Lucy left for her next farm this morning. Thanks for all your help Lucy, and enjoy building that polytunnel! 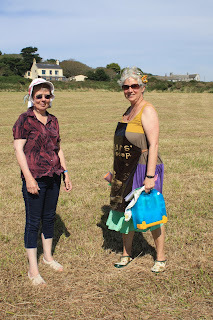 Lands End Peninsula Community Land Trust newsletter. Very little to report this quarter. We are entering into discussions to arrange a Design and Build contract for Moorland Close and Lafrowda Close, the most competitive way for us to deliver the projects. We still await the footpath diversion order for Moorland Close but anticipate that coming through in time to develop that project in one phase. Trustees seek applications from those with financial experience, preferably within the charitable sector. The Treasurer will work with our volunteer bookkeeper. Our mission is to obtain land for local community benefit. 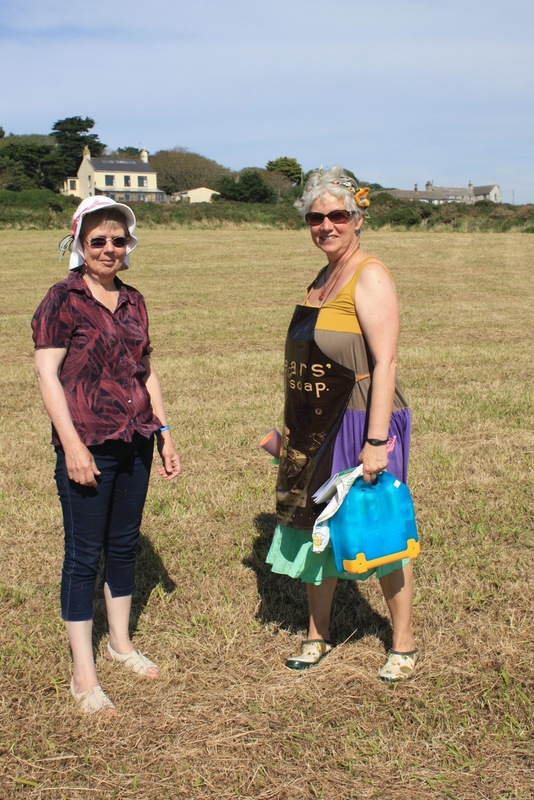 The Share issue raised an amazing £16,789 towards the purchase of the farm. 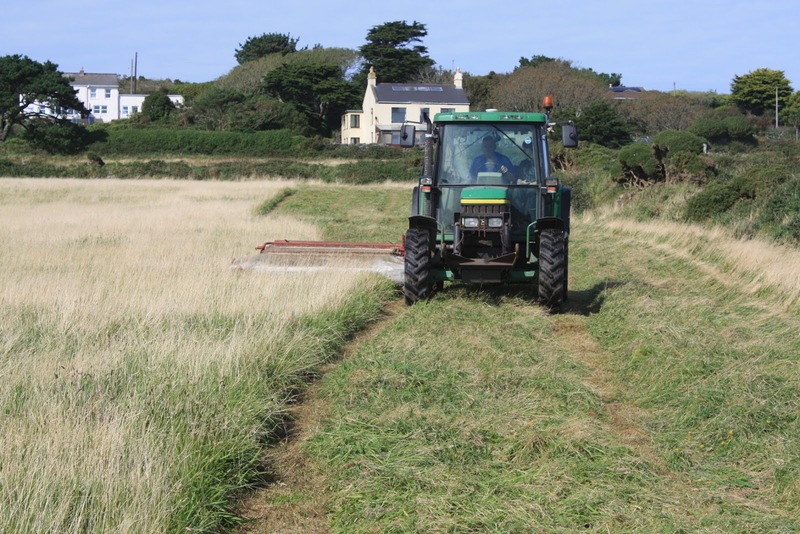 BCEnt is now working towards meeting the lottery conditions and negotiating the purchase of the farm with Cornwall Council. 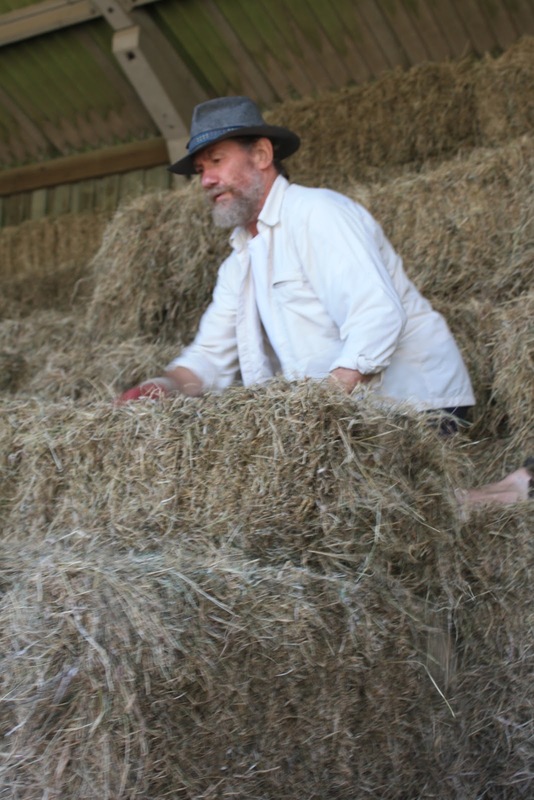 At the AGM on Wednesday 27 June Andrew Corser, actively involved with Bosavern Community Farm, became a new Trustee. The other Trustees remained the same. 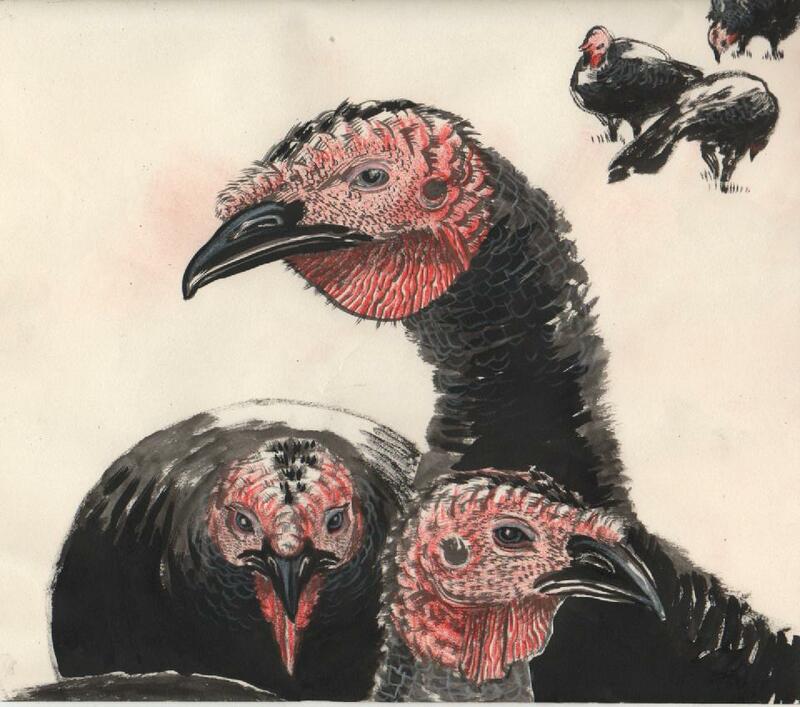 Ellie, one of our lovely Wwoofers, has just sketched our turkeys - great sketch too. 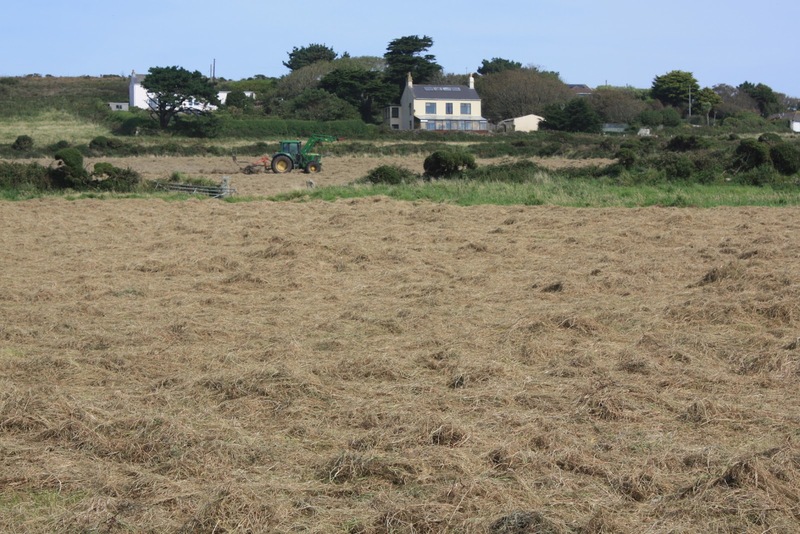 It's not just the hay that we've harvested over the past few weeks, but all this years onion crop, finishing during this afternoon's volunteering session. The bulk of our onions are brown "Sturon" onions, planted as sets in the maincrop field, with some red "Red Baron" onions planted as sets in the market garden field. They are now all stacked in the open barn in wooden crates to dry for storage. 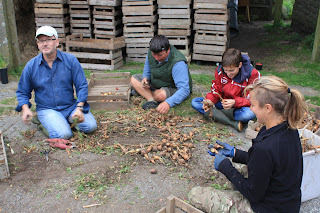 Harvesting onions - Simon, Ellie, Anne, and Adam. Sorting onions - Simon, Peter, Sabrina and Ellie. 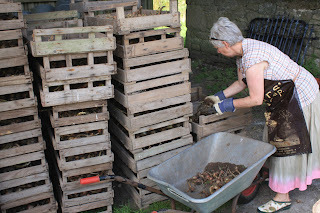 Stacking onions to dry - Sonja. 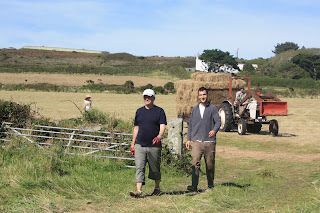 Having decided to leave the Soil Association at the end of May due to financial reasons, we are no longer allowed to refer to ourselves as "organic" or to sell our farm produce as such. Our ethos of farming and food production has not altered however, and so we have joined the Wholesome Food Association. 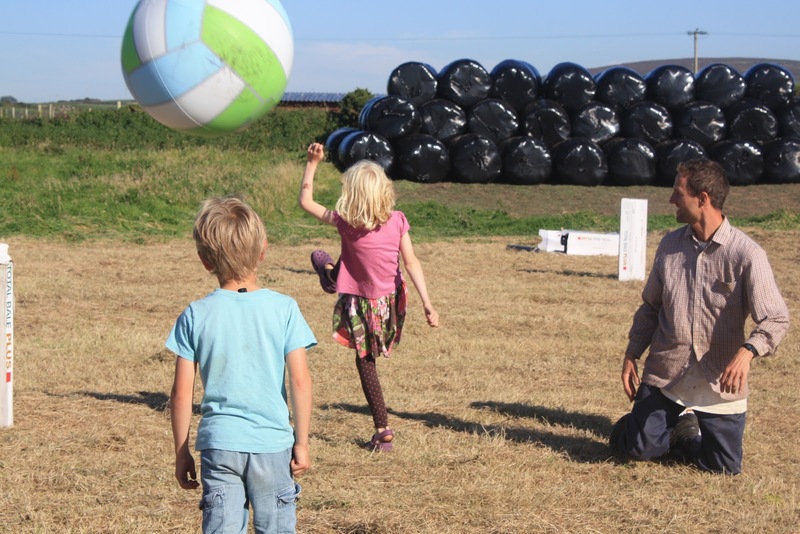 "The Wholesome Food Association local symbol scheme is a low-cost grassroots alternative to organic certification for people in the UK who are growing, producing, processing or distributing food for sale in their local region." Wholesome food is grown and processed using sustainable, non-polluting methods as close as possible to those found in nature. Wholesome food is, wherever possible, traded and consumed within a short distance of where it was grown. Wholesome food is an integral part of life and community, rather than merely a commodity for profit. 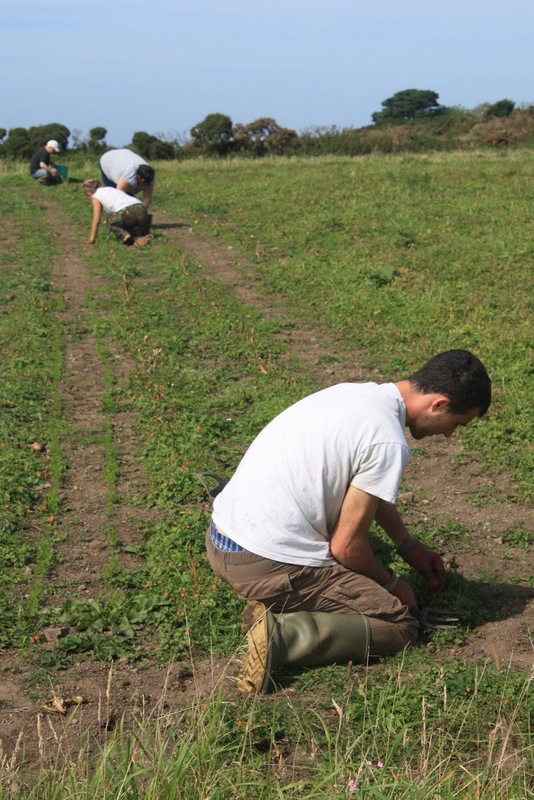 We do not set and enforce standards in the same way that organic certification bodies do. Instead, we have adopted a set of principles that address the vital issues of ‘food miles’ and the renewal of local economies and communities. 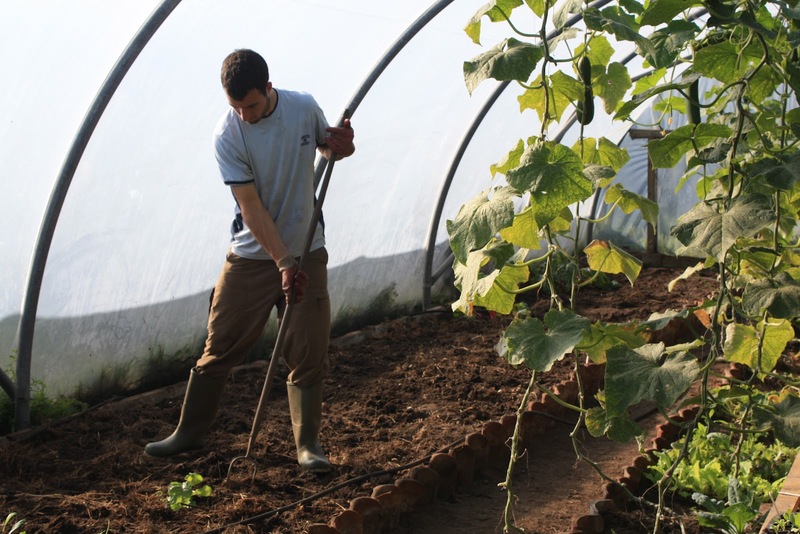 We consider that anyone who produces food according to these principles will be using wholesome, sustainable growing methods, and will also be mindful of the importance of localising food production. All WFA affiliates are expected to espouse the above principles and apply them in the growing, preparation and processing of all food sold under the WFA symbol. Having missed the window of good weather in July, we had to wait until the beginning of September for the next (probably final?) window of the year before cutting our hay. 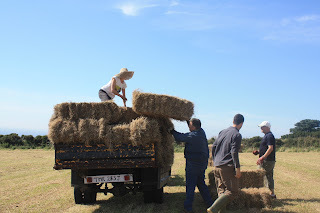 Like last year, we cut two fields and made small bales of hay to sell to local people and raise money for the farm. 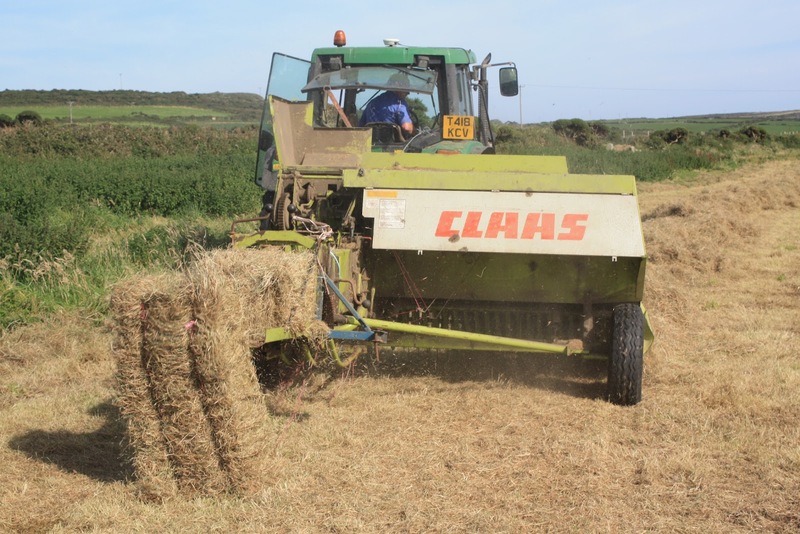 The hay was cut on Friday 31st August, then turned every dry day, before being baled on Thursday 6th September. 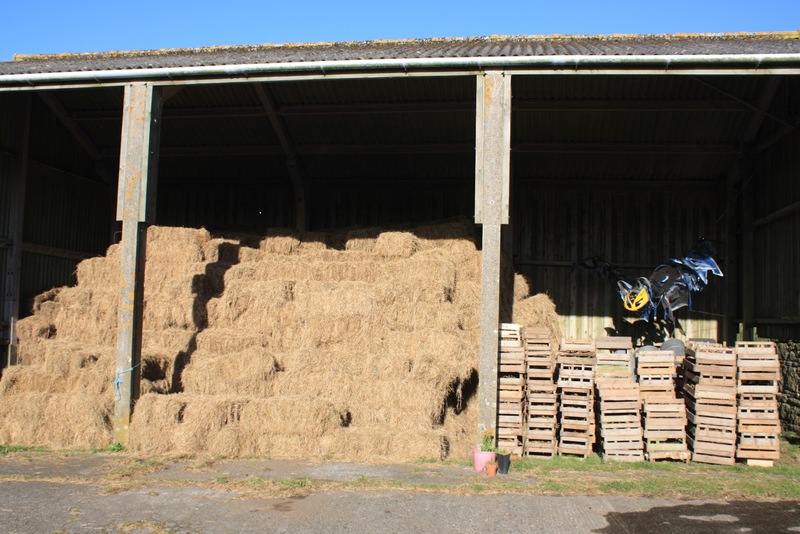 Luckily we had 4 glorious days of hot sunshine with drying winds, to dry, bale, bring in and stack 850 bales of hay. We finished on Saturday afternoon, celebrating with cold cider, local cheese, brandy trifle, and an enormous ball! As usual our wonderful volunteers - local, national and international - made all this possible and were/are a pleasure to work with. Our hay goes on sale tomorrow at £3 a bale. Cutting the hay - Friday. Turning the hay for its final dry - Thursday. 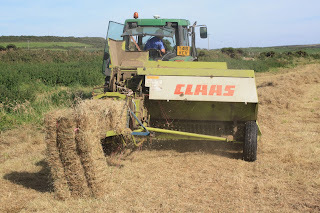 Baling the hay - Thursday. Hugh and Adam collecting the first of 18 loads of hay - Thursday. Packing the trailer - Adam, Ellie, Alice, Hugh and Jim - Friday. 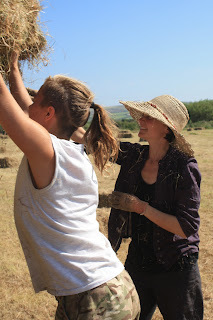 Ellie and Alice loading a bale onto the trailer - Friday. 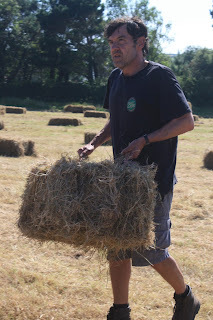 Jim carrying a bale of hay - Friday. 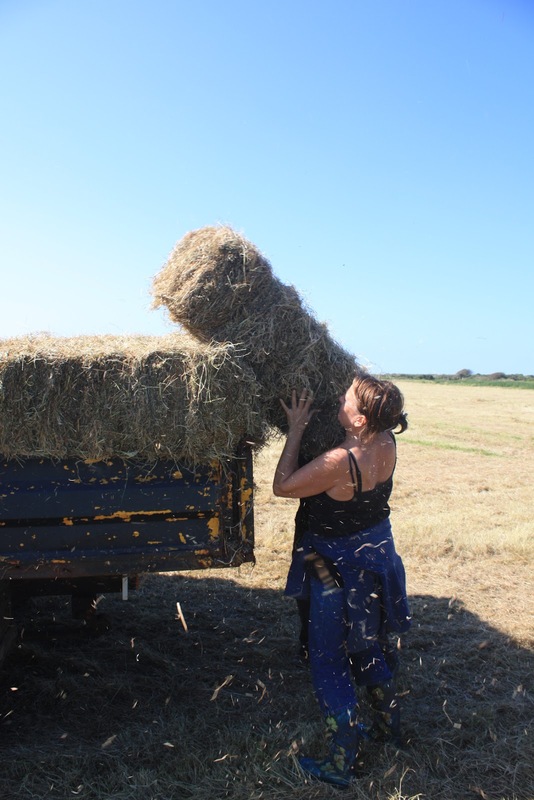 Lucy loading a bale - Friday. 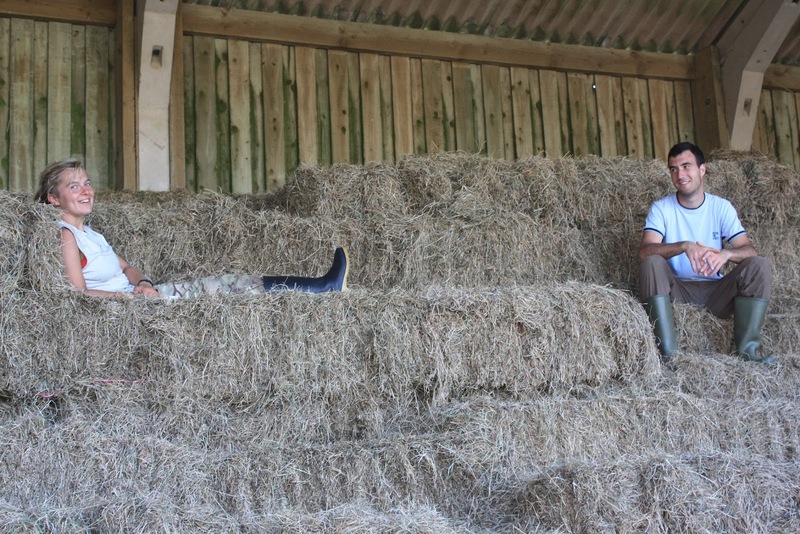 Ellie and Adam rest on the hay at day's end - Friday. Jenny and Sonja - Saturday. Andrew stacking bales in the open barn - Saturday. 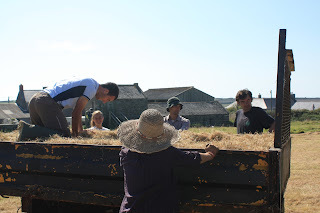 Loading hay - Alice, Morley, Adam and Simon - Saturday. Bringing in the final load - Alice, Simon, Adam and Hugh - Saturday. 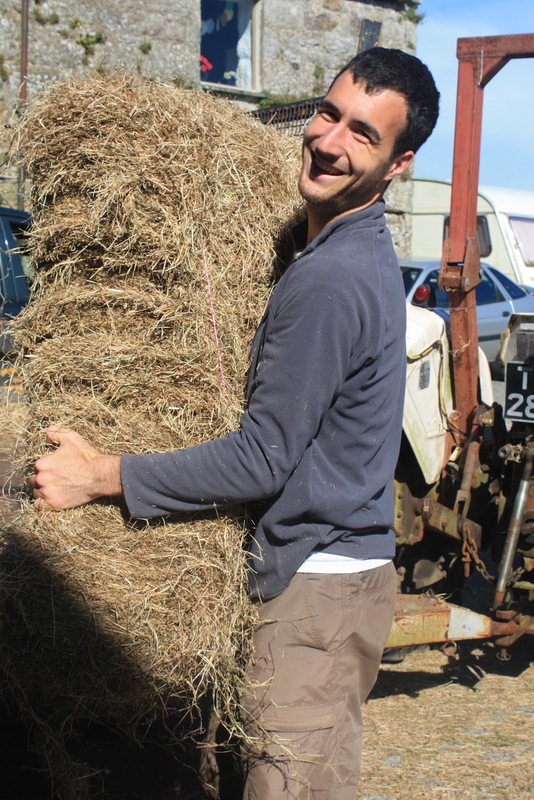 Adam unloading the final bale - Saturday. 850 bales of hay stacked in the barn - job well done! - Saturday. Celebrating afterwards, involving cider, trifle, and an enormous football... - Saturday. Taking their first tentative steps outside their new home. 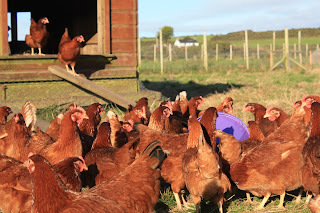 On Friday 31st August our latest batch of laying hens arrived on the farm - 101 Columbian Blacktails. Unlike our previous two batches of hens, these are "point of lay", meaning that any week now they will start laying eggs for the first time in their lives. The eggs will be smaller, thicker-shelled, and from 101 birds we should be getting between 80 and 90 eggs per day. The birds themselves are small, soft to the touch,and timid. 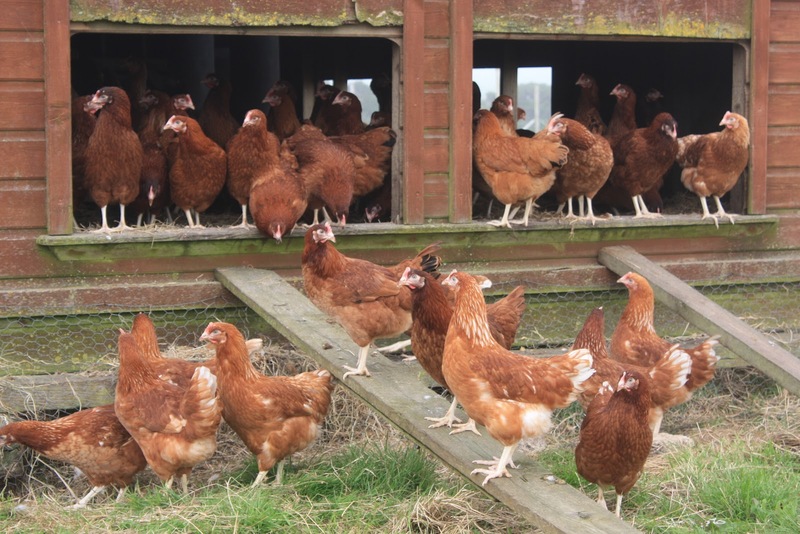 Our other 139 surviving hens are getting old, and many are in their "winter" moult (an indication of how poor this summer has been? 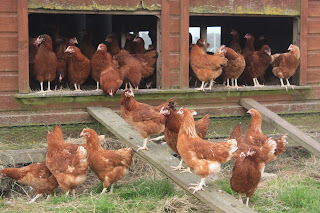 ), so are laying very few eggs, between 30 and 40 a day in total. They are also Columbian Blacktails, but were already 18 months old when we bought them, so are now either 40 or 32 months old depending on which batch they belong to. Their eggs, as well as being few in number, are big, soft-shelled, and the birds eat several themselves every day. Progress in the Veggie Field. It's been two years now since we restarted growing vegetables in the veggie field. Those of us who see the field every day don't always notice how much progress has been made over time, but looking back through our catalogue of photos reveals how much has been achieved. The southernmost of the four veg strips, 24th August 2010. 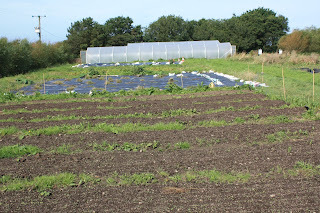 The above photo shows one strip looking towards our single polytunnel, two years ago. The strip is a mass of weeds, mainly black nightshade and couch grass. This strip was 2012's potato strip, yielding 20 beds of maris peer and pink fir apple spuds, as well as salads, chard, and beetroot, and has already begun its role as 2013's onion strip, with eight beds of leeks planted, as well as spinach, and more salads, chard and beetroot. The same view, 28th August 2012. This photo is of the same, taken last week. The beds are now either prepared and sown with crops, or covered in black plastic mulch to kill weeds. 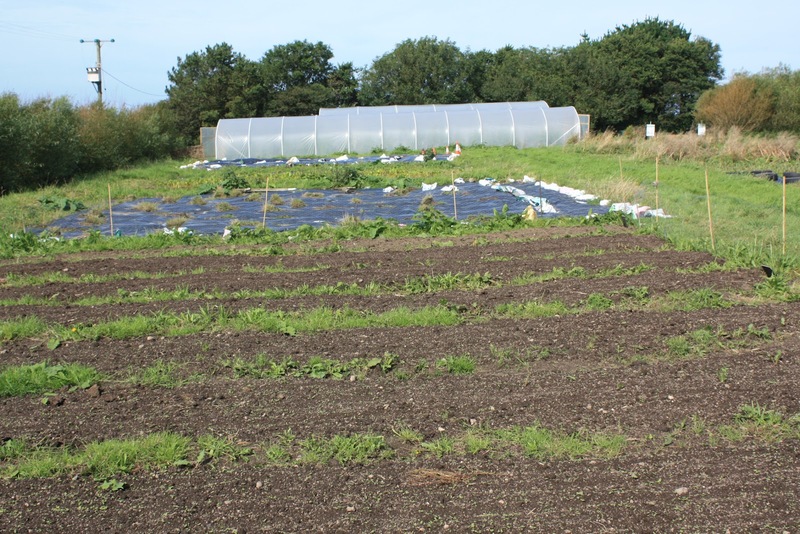 At the end of the strip you can see our second longer polytunnel erected next to the original, almost doubling our protected cropping area. 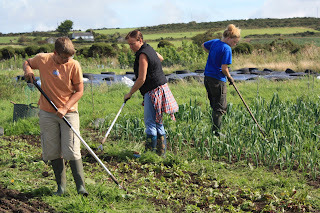 Volunteers hoeing between leeks and beetroot. 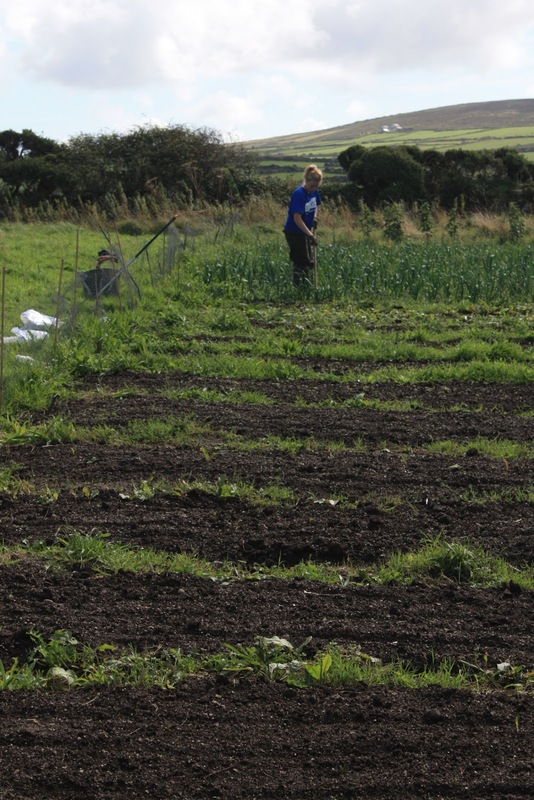 And this is the other end of the same strip, with Louise, Lucy and Ellie weeding the beetroot and leek beds inside their rabbit fencing. Quite an improvement! Many thanks to Louise, who left yesterday to start a new job, having volunteered on the farm for two weeks. People who get up early and work all day with a smile on their face are always welcome! Good luck in your new job. Louise cleaning out chickens (usual Friday afternoon job, after veg box harvesting is done). A big thank you to Ellie, who wwoofed on the community farm for three weeks, and departed on Thursday heading for Borneo via Singapore. 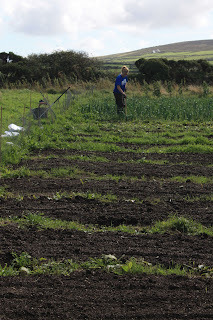 Ellie hoeing leeks on the veggie field.